Thinking about updating your home’s exterior? It might surprise you to learn how little, subtle mistakes can make a huge negative impression on a home’s exterior. This Renewal by Andersen of New Jersey and New York Metro article will help you avoid four common mistakes people make when giving their home’s facade a make-over. Have you ever seen an otherwise beautiful home, with a pleasing curb appeal, but knew something wasn’t quite right? The reason could be the shutters were too narrow for the windows. Functioning shutters are perfectly sized to cover the window when closed. Even if you don’t plan to ever use these charming accessories, make sure they appear functional. Another common fail also has to do with installing shutters. Adding shutters to a replacement window that looks perfect without them can be a real distraction. Some designers say that shutters and double-mulled windows clash, even if the shutters are sized perfectly. Unless you plan to use the shutters as weather barriers, skip them on bays and bows, most dormers and large, fixed windows, too. Most interior and exterior decorators will tell you not to be afraid to express yourself by unconventional design techniques. But, when it comes to mixing and matching window styles, shape plays an integral role in defining your overall aesthetic. A single window with a curved top, or several placed symmetrically across the front of your home often adds visual texture. However, a miss-mash of random shaped windows, with different shapes and sizes can look messy instead of marvelous. Even changing window grill patterns can mess up the look. Here’s a tip: Prairie grille patterns are endemic (seen all the time) in Craftsman, Prairie and Arts and Crafts style architecture. They can look a bit out of place in other settings. Consider using the Renewal by Andersen Window and Door Visualizer to “try on” different window shapes and grille patterns before finalizing your buying decision. Creating a harmonious curb-appeal means choosing complementary window styles and accessories. While dormers, and even miniature bay windows, offer a touch of individuality and visual interest, dormers should complement and extend the overall aesthetic. A general rule of thumb is that the window should consume about ¾ of the dormer, anything less looks like an add-on without much thought, kind of like painting one door on a black car white. It draws the eye, but not in a good way. You can balance a single (or multiple) dormers with existing architectural features by adding an entrance pediment with the same roof pitch and paint as the dormer or bay. Fortunately, decades of helping our New Jersey and New York metropolitan friends and neighbors has given Renewal by Andersen the experience to guide homeowners toward wise choices. We can offer tips and strategies to make the process more efficient. The easiest way to avoid making these simple missteps is spending some time looking at homes in your neighborhood with similar architectural styles and elements. Browse online design magazines. Visit the inspiration gallery to explore options for your home upgrade. And, if you’re still not sure which grille pattern or style will help you create a beautiful facade, just ask. To learn more about our portfolio of replacement windows, patio doors and accessories, just fill in the short form on this page or dial 1-888-826-2451 to schedule a no-obligation home consultation. The Renewal by Andersen of New Jersey and New York Metro helps people turn their houses into comfortable, welcoming homes. Our precision-crafted replacement windows and patio doors instantly transform a tired home with worn-out curb appeal into an attractive space with a beautiful view from both sides of the glass. If you’ve been putting off updating your patio doors because the process seems overwhelming, this article should put your fears to rest. Updating with replacement patio doors is as easy as 1-2-3 and you’re done. Choosing replacement patio doors manufactured for superior performance and functionality is important. We offer three distinct styles that enhance energy-efficiency, provide abundant natural light flow in your home and offer simple operation. During the design process, you’ll decide whether you prefer a traditional hinged, French-style door or a sliding option. There are two gliding styles too, one that looks like a hinged-French door, and one that is sleek and contemporary. While designing your new patio doors, you’ll also select hardware, frame colors, grilles, insect screens and other accessories. Typically, homeowners complete the design phase in the comfort of their own home, or with a consultant in our showroom. Learn more about each replacement patio door component by visiting the web pages linked below. Whether you visit a showroom to design your patio doors, or have a private, in-home consultation, a representative will measure each door you plan to replace, and fill out an order for the factory to build your new patio entrance door exactly to your specifications. Once you approve the order, all that’s left is waiting a few weeks for skilled technicians to buidl, deliver and install the new door. Waiting is perhaps the hardest part of the process. Manufacturing processes, exceptional craftsmanship and superior construction materials come together to ensure your new patio door is strong and durable enough to keep performing for as long as you live in your home. Year after year you will enjoy the crystal clear view through the glass, the fade and weather-resistant frame and trim work, and the easy-to-use functionality. We are so confident you will love your new patio entrance doors, we offer one of the most comprehensive warranties available from replacement product dealers. Have questions we didn’t answer in this blog post about replacement patio doors for your New Jersey or metropolitan New York home? Fill in the short form on this page to request a brochure or schedule a private consultation by dialing 1-888-826-2451. Is winter really a good time to update home windows with high-performance replacement windows in New York and New Jersey? It is if your old windows aren’t doing their job anymore. US Department of Energy studies suggest poorly performing home windows are responsible for up to 25% of your heating and cooling bills, and much of the conditioned air sneaks out through or around the window unit if you don’t repair or replace damaged windows. That is wasted money you could be spending on something more important to you or your family. With Renewal by Andersen of New Jersey and New York Metro’s Winter Installation Method, any season is a good time to install replacement windows, and today is a great day to get started. Replacement Windows are like a yummy holiday dessert. Read on to learn how and to get a free Banana Pudding Cheesecake recipe. Many people in New Jersey and metropolitan New York host huge family gatherings around the holidays. If you’re not hosting, you’re probably attending one and don’t want to show up empty-handed and bringing an extra dessert is always a welcome addition to a holiday gathering. Planning a holiday menu is what led one of our Renewal by Andersen team members to decide designing replacement windows is similar to baking a mouth-watering dessert worthy of repeating year after year. Delicious food doesn’t just happen. It is created. You must start with high quality ingredients, selected for freshness, taste and textures. The best results come from measuring precisely, blending just enough, but not too much, and cooking for a very specific amount of time at the right temperature, using the proper baking dish. While it may sound strange, designing replacement windows requires the same intentional patterns as baking a beautiful cheesecake. In the same way that flour type and quality directly influence a dessert’s taste and texture, high-quality construction materials, like Fibrex, affect performance. Optional garnishes enrich the dining experience, and choosing accessories, like window screens, handles and grilles, adds a bit of visual interest. Without accurate measurements, your cake won’t taste right or may crack or puff up in the center, ruining its appearance, as well as its taste. You can toss a dish that doesn’t turn out and start over, but building a replacement window that doesn’t fit the opening left when your existing windows are removed could mean spending hundreds of dollars modifying your home’s structure to get a good fit, and the hassle of finding a contractor with skills and expertise to do the job right. 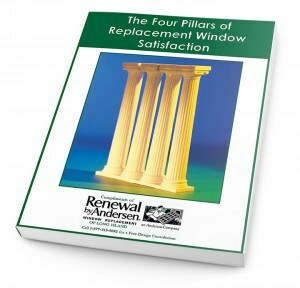 Over decades we have created a replacement window recipe for success. And, we found a desert recipe we think is sure to please everyone on your guest list, too. Learn more about Renewal by Andersen of New Jersey and New York Metro by filling in the short form on this page or calling 1-888-826-2451. This isn’t a quick and easy dish, but your family and friends will appreciate the time you spent creating this mouth-watering confection. Combine crushed vanilla wafers, chopped pecans, and melted butter. Press into bottom of a lightly greased 9-inch spring-form pan. Stand vanilla wafers around edge of pan, gently pressing into crust – rounded sides facing outward. Combine bananas (both diced and mashed), lemon juice and zest in a small saucepan. Add brown sugar. Cook over medium heat until sugar dissolves, 1-2 minutes. Remove from heat. Beat cream cheese using an electric mixer on medium speed for 3 minutes. Gradually beat in granulated sugar. Add eggs, one at a time, scrapping down sides of bowl after each addition. Incorporate well, but avoid over beating. Add vanilla and banana mixture, Stir until evenly mixed. Lightly sprinkle crust with nutmeg. Pour batter into spring-form pan on top of crust. Bake for 45 to 55 minutes, until center is almost set. Jiggle the pan to check. Turn oven off, prop oven door open 5 – 6 inches and leave cheesecake in oven to cool for 1 hour. Remove cheesecake and cool on counter 30 minutes, the cook and refrigerate at least 8 hours before serving. Garnish with whipped cream and vanilla wafers, and enjoy!